Captain Rob at Youtube RC Model Geeks is doing a build/review video of the DW Storch kit. I've just trolled through all the RC Geeks videos but can't find the DW Fieseler Storch. Can you supply a link please? Sorry should have said part 1 announced last week has not appeared yet. "A Watched pot never boils" or so they say. 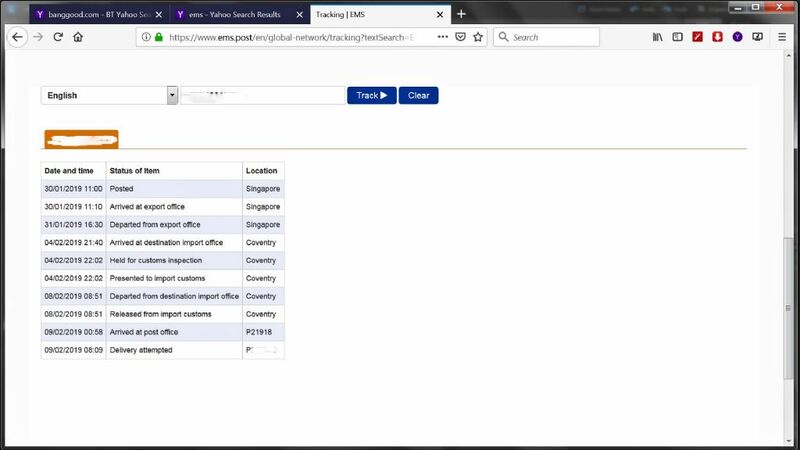 Is tracking worth the hassle? I've been watching the journey of this kit from China? Singapore, Coventry & Finally Preston. On Friday the tracking said released from customs awaiting payment of dues, or words to that effect. As I didn't want to hang around waiting for a letter from PF with a reference to enable me to pay online, I rang them, "no" you can't pay the charges without the 17 digit code. 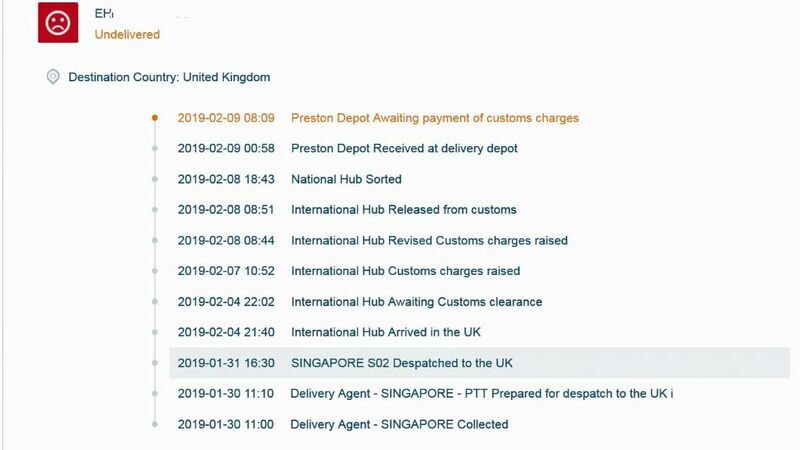 On Saturday morning the tracking said the kit was at my local PF depot wait custom charge payment, I rang them & a robot said they were closed until Monday. You would think in this age of enlightenment that we wouldn't have to rely on a snail mail document before we could get things moving, rant over. Come back Pony Express. Following another 72 hours of uncertainty, the kit has finally arrived. It arrived at Parcelforce's local depot early Friday morning. 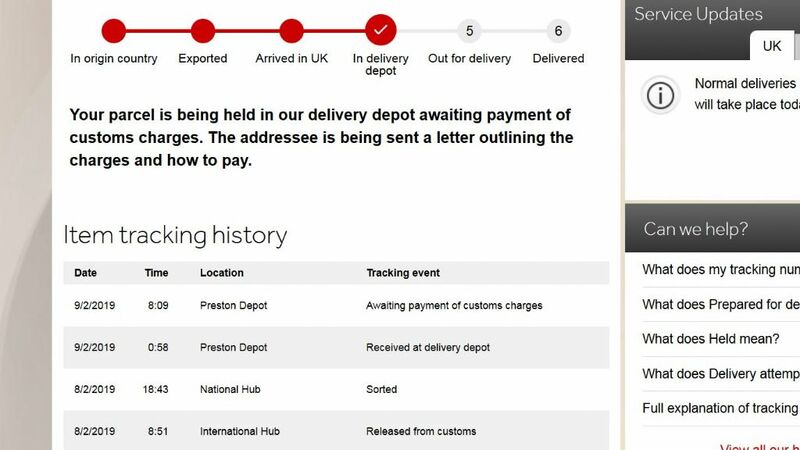 Yesterday after yet another phone call I was able to pay the £21.96 duty & was told it would be delivered today. At 9.30 am it was still showing in the Preston depot, so I made another phone call. The lady said it should go out today but wasn't sure, it was scheduled, but had missed the scan. As I was telling her what I thought of PF, my bell went, guess who, PF. I collected a battered box from the driver that had obviously been opened, had no additional protection & was sealed with a single strip of sellotape. I opened the box & examined the contents, good point, there were two wing plans, bad points there was no fuselage plan & the wing & tail plans were folded concertina fashion. There is a glossy coloured 4 double paged "manual" stapled together, which is a copy of the PDF manual I obtained from DWH. As usual all the components were in separate plastic bags taped to the inside of the box. Not impressed & I won't be buying another kit from Banggood. 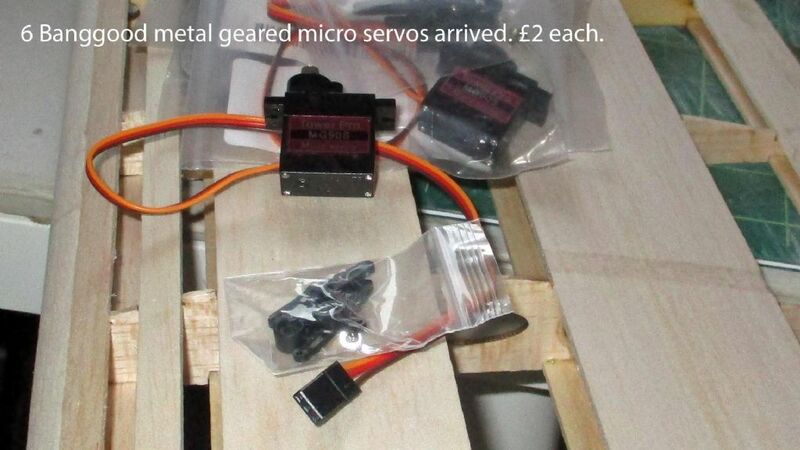 Still to arrive the 6 metal geared micro servos ordered after the kit. Final comment, as I was writing, the postman delivered the import invoice, which reads custom duty 0. excise duty 0. import vat £9.96, other 0. clearance fee £12 (zero rated for vat) total £21.96. Total cost of kit including duty £125.79 & 3 years off my life. It's now gone into storage on top of the wardrobe, will have to decide later which comes after the Pilatus, the Klemm or Storch. Both will keep me out of mischief for the rest of 2019. Last part of my order from Banggood arrived this morning, 6 metal geared micro servos, £2 each, they will be perfect for the Storch as it needs 6 for the wings alone. Why 6 servo's in the wing? Aileron and flap each side, what else moves? Have the manufacturers made the slats move too, unlike the real Fieseler Storch? Looks like a decent enough kit, watching with interest. Hi Reg yes the slats have a servo each side. They do move on the original, they are connected to bike type chains with a handle on the R/H side of the cockpit. Depending on what type of flying the aircraft is performing, depended on the the setting. There is a very good series of films on YouTube by Kermit Weekes where he is flying the Storch, I think it shows the slat operation. 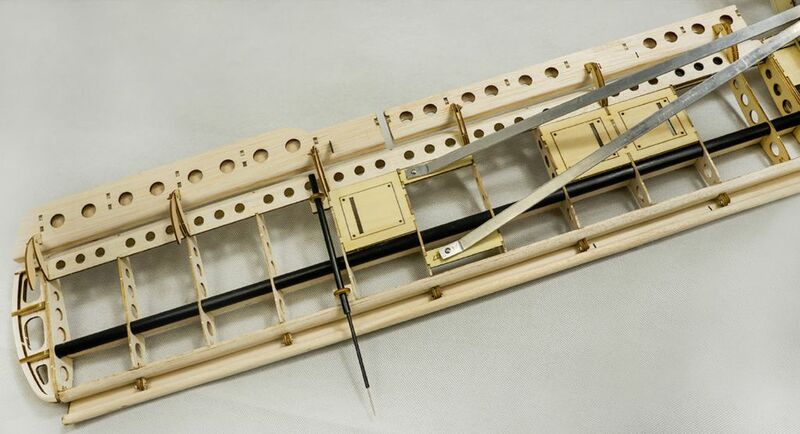 Re the kit, I would imagine the week point is the wing attachment, most other Storch kits I have seen have some form of metal / wire reinforcement between the fuselage & the cabin top. Another poor point is the glazing of the cabin top where the gun sits, it's held on with magnets & is very poor celluloid. The slats are definitely fixed on the Storch Eric so you could save yourself a couple of servo's. 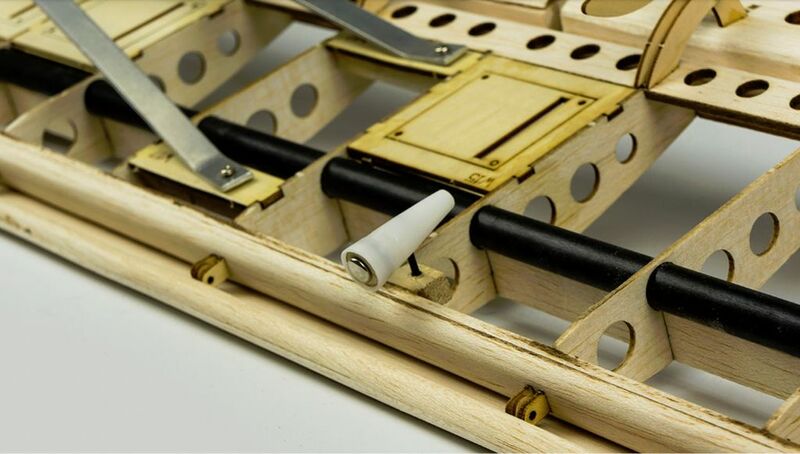 The chain and linkage on the port cabin side is for the flaps, which are interconnected with the ailerons to droop the aileron when the flap travels past about 20 degrees IIRC I'd love to see the set up for the slats on the model, do they push forward or roll forward to open them? Any images you could share from the manual? Hi, Not on mine they aren't! If you look at the first posts when I was researching the kit, there are pictures of how the slats are hinged. Whether this is correct or just DWH's interpretation of how the slats operate I'm not sure. I don't want to sit through the Kermit Week's YT videos again, but I'm 99% sure he described how they operate & the chain is definitely on the R/H (starboard) side of the cockpit, but could be duplicated on the port side? There is also a page in the manual showing the wiring of the 6 wing servos. If you use the link, it will take you to BG's page with the model, scroll down to the bottom there is a link to the English manual. Up-date on the slat discussion. I watched the Kermit Weeks YT vids through again . At the beginning of the second vid' he was describing the slats & their operation. He briefly mentioned they were spring loaded & the gap between the wing & slat varied with the angle of attack of the wing. The ailerons are also coupled to the flaps, in that, when the flaps were deployed, at their furthest travel, the ailerons also drooped. I must have been dreaming when I saw a chain driven control wheel on the R/H side of the cockpit, or it could have been on another Storch. Apparently, after the war, the French liked them so much, they continued to build their version. The flaps on a Storch are operated with a wheel, on the left side of the cockpit, at lower window height. It actuates through a bare bike chain to a cog in the cockpit roof. It then does both wings. Turn the handle, clockwise?, and the flap deploys to 20°, thereafter, the flaps and ailerons go down at the same rate, to end of travel, 40° flap, 20° drooped aileron.. The French Cricket was the same. You may be right about spring loaded slats. But I've never heard them mentioned. And having looked at one, and pulled and pushed its bits, the slats looked and felt rigid. So why inflict 2 extra servos on a small model. If it's not kept light it won't float like a Storch. The two servos weigh under 30g total. The model has a massive wing area for the stated build weight, which includes 6 servos. So, why not? It will be more of a build project than a regular hack, so i will be following the manual, just have to work out how when & why the slats are mean't to operate. Someone else mentioned Model Geeks will be reviewing it in the future. Maybe by the time I get to it they will have built & reviewed it. When the Storch was current during WW2, the pilots were very impressed with the advantages of the leading edge slats and suggested that fully adjustable retracted slats would increase the Storchs pitiful flying speed. "Fi 156 B: Fitted with a new system which could retract the normally fixed leading edge slats and had a number of minor aerodynamic cleanups, boosting the speed to 208 km/h (130 mph). The Luftwaffe did not consider such a small difference to be important and the Fi-156 B was not produced." I've always liked the Storch concept though the reports I'd heard of the BlackHorse version's lousy handling put me off trying one. I think I mentioned earlier, back in the day, I flew a friends Svenson Storch. Then we were asked to do a display at a local school. The day was very windy & not really suitable for the Storch & resulted in me stalling it at around 20ft & it was quite extensively damaged . Then back in 2004/5 I acquired a Svenson Storch kit & was going to fit a new four stroke that had just come out. Eventually, I chickened out & sold it on. There is one for sale RTF at £300 that looks a good buy, IMO well worth the investment., whoops, just checked & it's sold pending collection & payment.